We have already seen how focal length can be changed to perform focusing. This same effect can be used to construct a zoom lens. Here we see you the lens groups will move as we zoom from wide (W) to telephoto (T) in this 70-200mm lens. We also see how group G3A moves as we focus closer than infinity. Also, there are lenses in G4 that move up/down; this is the Vibration Reduction (VR) feature. On each side of the VR elements are field stops to maintain image quality when these elements are moved off-axis. As focal length goes up the entrance pupil gets larger and moves further to the right; this is a constant f/4.2 lens. 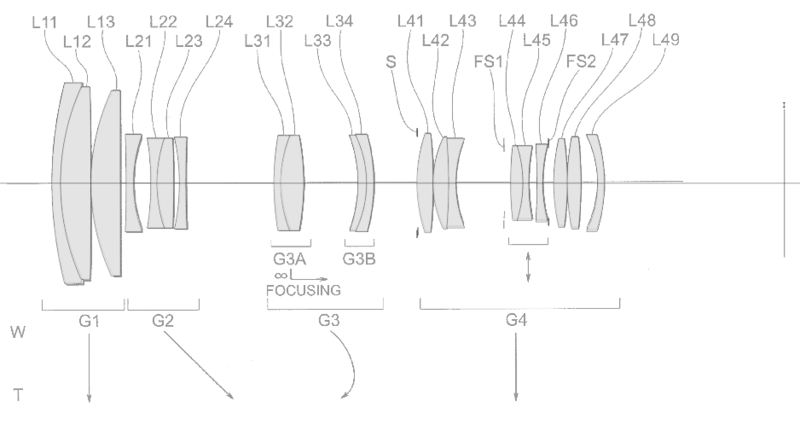 Also, as we would expect from the initial drawing, this lens does not change length during zoom (or focusing).